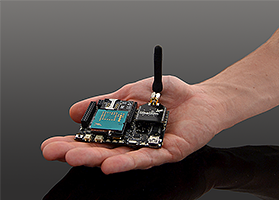 Waspmote: Wireless Sensor Networks Open Source Platform. Complete catalogue available online. Waspmote is an open source wireless sensor platform specially focused on the implementation of low consumption modes which allows the sensor nodes ("motes") to be completely autonomous, that is battery powered. Lifetime of Waspmote sensor nodes may go from 1 to 5 years depending on the duty cycle and the radio used. Waspmote was launched by Libelium in November 2009 and now, we will start distributing the complete OEM catalogue to our followers. Four years after releasing Waspmote, there is a growing Community of Developers using it as a standard platform for the Internet of Things. Besides its outstanding technical features, they like its horizontal, modular and Open Source approach. One year ago, we started to sell the Waspmote Starter Kit, a simple kit with 802.15.4 RF Link to bring our platform for the Internet of Things to the makers. Then, we launched several kits to complement the Starter Kit such as Events, Gases or Smart Cities Kits, which included a few sensors to use with Waspmote. Now, we want to allow the Makers to use their own configuration over this platform, so we have added the entire catalogue for this OEM solution. You will be free to configure your own network with the Waspmote boards and sensors you need. Along the current year, we have received several awards, giving keynotes about the Internet of Things and workshops in Spain and USA to introduce Waspmote to the Makers. Now, many people who started using Arduino in their projects, are using Waspmote due to the friendly environment and use. Check our Waspmote Section and find the appropriate solution for your project.